The general topic involves experiments with correlated photons. In the Immersion we will cover the following lab exercises, which include full hands-on setup and alignment: Spontaneous parametric down-conversion, single-photon interference, quantum eraser, Hanbury-Brown-Twiss test, entanglement, Bell inequality violation. The goal of the workshop is to get faculty to learn how to set up and do the experiments. Although we have sessions where we discuss the significance of the experiments, mot of the time is spent on hands-on experimentation. This way, participants are able to go back to their institutions and be able to put together an apparatus and implement successful experiments. Experiments with single photons can powerfully illustrate the fundamental principles of quantum mechanics in a very simple laboratory setting. In this Immersion, participants will perform experiments, on a single apparatus, illustrating two major topics: the wave/particle duality and the nature of quantum entanglement. Thirty years ago, such experiments represented a tour de force of technology and equipment; today they can be done in a few afternoons in a junior-level optics lab, thanks to current photon-counting technology and the use of nonlinear crystals to produce entangled photon pairs. Yet these experiments are still closely related to active research in quantum information and the fundamentals of quantum mechanics. 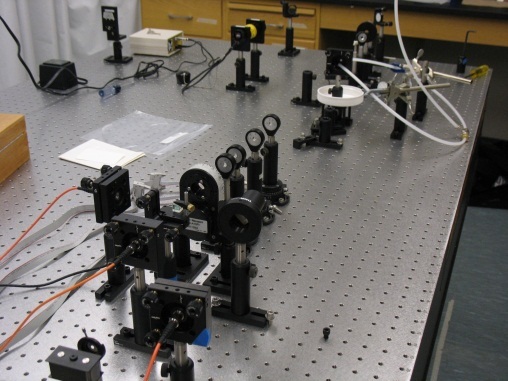 Figure 1: Overview of optical beam path, from pump laser at the far end of the table to fiber couplers in the foreground. 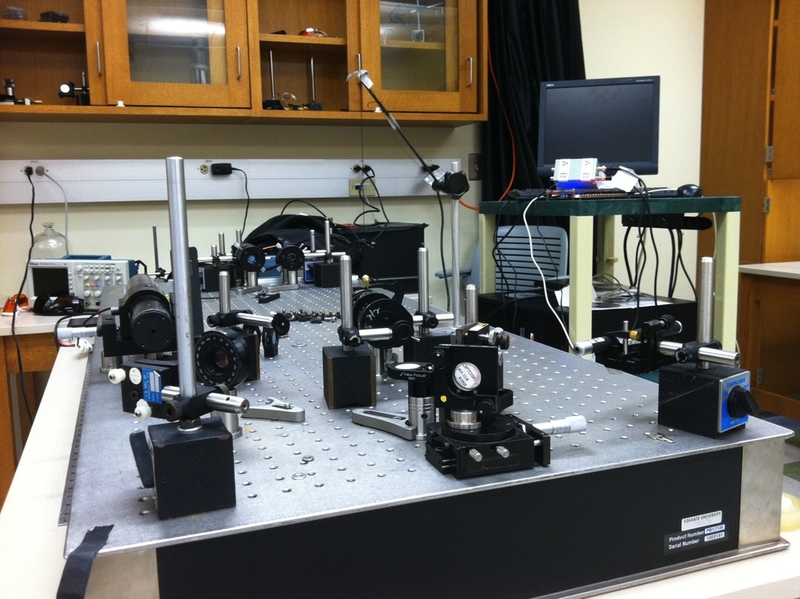 In this immersion, participants will use a simple apparatus that produces near-IR photons in pairs via the process of spontaneous parametric downconversion in a nonlinear crystal, and detects them via photon-counting silicon avalanche photodiodes. The photon pairs allow for two general categories of investigation. First, we can conduct experiments on individual photons by using one member of a pair to herald the existence and arrival of the other member, on which the single-photon experiments are carried out. 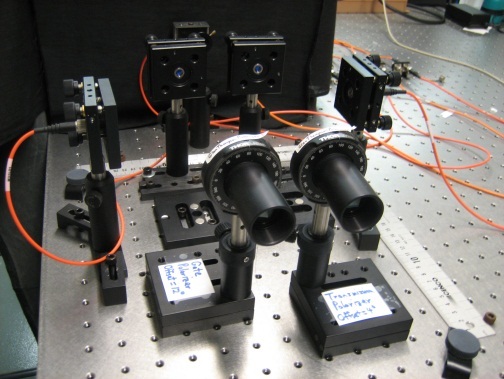 Participants will use this approach to observe the existence of single light quanta (photons), by seeing that photons incident one at a time on a beamsplitter never produce simultaneous clicks on both output ports. We will then observe that photons incident one at a time on an interferometer nevertheless exhibit interference fringes, highlighting the wave/particle duality. 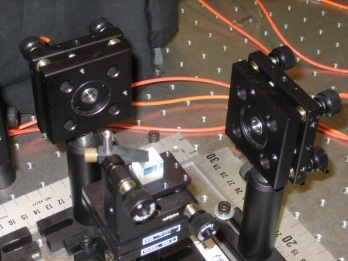 Figure 2: Beamsplitter and fiber couplers for existence of single photons experiment. The second category of investigation makes use of the quantum-mechanical entanglement between the paired downconversion photons, most notably in their polarizations. Participants will read about and discuss Bells inequality, and perform a measurement of polarization correlations that clearly violates Bells inequality and thus rules out local hidden variable theories as an alternative to quantum mechanics. Figure 3: Polarizers and fiber couplers for violation of Bell’s inequality. The immersion will be three days long. The intent is to make it feasible for participants to introduce the experiments at their home campuses; thus we will address alignment of the optical elements and setup and calibration of the photon-counting electronics, as well as data acquisition, analysis, and interpretation. Reading from lab manuals and selected journal articles will be assigned beforehand; participants should bring their reading, reading notes, and a lab notebook. Laser safety goggles to be worn on their own or over prescription glasses will be provided on site, and should be worn as directed during experimental work. A good estimate for the cost of this experiment is given by Mark Beck's numbers. Our own apparatus was mostly purchased years ago when the parts were more expensive. Mark puts the total at about $24,000 to get everything from scratch. In this immersion participants will learn to perform advanced undergraduate laboratory experiments that explore modern aspects of quantum mechanics. The laboratories all involve studying the behavior of single photons and correlated photon pairs, and include experiments on "proving" that light contains photons, single-photon interference, and tests of local realism. Additionally, the immersion will contain discussions of the physics behind these experiments, and how they can be integrated with a junior/senior level quantum mechanics course. The light source for all of the experiments uses a blue diode laser to pump a nonlinear crystal, which produces photon pairs via spontaneous parametric downconversion. The photons are detected with single photon counting modules, and the photon-count data is further processed with an FPGA-based coincidence counting unit. Final data acquisition and analysis is performed on a PC using LabVIEW. Participants will become familiar with all aspects of the apparatus. All equipment necessary to perform these experiments (including safety equipment) will be provided, and participants will not need to bring anything. During each session there will be time devoted to discussing the theory underpinning the experiments, as well as suggestions for integrating the experiments with a quantum mechanics course. For more information on the experiments, please visit http://www.whitman.edu/~beckmk/QM/ .